Rear Caster set for EZ rolling to and from plane . 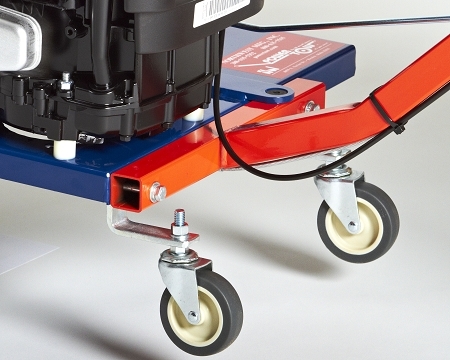 Caster wheels are not used in the actual moving of aircraft. I used the angle brackets in the kit and added a cross member the same width as the unit frame and installed 4" casters with spacers for better vertical and horizontal alignment to engage the tail wheel axle and still leave room to push down on the handle and load the drive tire. This is because you are having to align the unit with one hand while using the other hand to pull the engagement lever. The stock kit puts the handle very low and are not helpful compared with the stock supports. Great Hardware. Worked as described. The 40EZ Powertow is GREAT!! However, unless you're very short these little wheels are not necessary. If I hold he handle and move the tow around these wheels don't touch the ground.